Calling all aspiring writers... Join us at Galion Public Library and write a novel in one month. This will be our second year of participation in NaNoWriMo. Participating writers will be able to share their progress and support one another through the NaNoWriMo process. Refreshments will be served at the kick-off and wrap-up parties. Call the library or stop by the main desk today to register for these programs. Come in anytime during regular library hours for a holiday craft to make and take home. For children of all ages. No registration required: you can just show up. Ask at the children's room desk for more information. The children's department will be showing a PG-rated animated feature film. (If you are curious about the film, you can see the movie listing on IMDb.) Popcorn and punch will be served. For grades K-6. Registration is required: call the library or stop by the children's room to sign up. Remember to bring your blanket and pillow. Fri, Dec 27th at 3pm. Come out in the cold for some wintery crafts, games, and treats. For grades K-6. Registration is required: call the library or stop by the children's room to sign up. Sat, Jan 18th, 2-3:30pm. Dress in your fanciest and come celebrate Valentine's Day with our 3rd annual Fancy Nancy tea party. For grades K-2. Registration is required: call or stop by the library to sign up. Sat, Feb 1st, 2-3:30pm. Join us for our own version of the 2014 Winter Olympics, just for kids. For grades 3-6. Registration is required: call or stop by the library to sign up. Sat, Feb 15th, 2-4pm. The Friends are holding their annual Christmas raffle again. The prizes this year include a Cleaning Done Right gift basket, donated by Dez Smith; a hand-painted signed and dated figurine, donated by Barb Farina; Galion Community Theatre tickets for 2 to a 2014 season production; two gift certificates for $60 toward a computer tune-up from Galion Computers and Tools, donated by Johyn Renock; 18 holes of golf for two, including cart use, at the Galion Country Club; an Advance Auto gift box; a Friends of the Library gift basket set; a Ballreich gift basket; a swan statue from the Evergreen Company, donated by Sue Gimbel; a $20 gift certificate from the CDandi Bar, donated by Beth Cramblett; a handmade plush bear, donated by Betty Unkrich; a Crossroads scents gift basket, donated by Cori Kreuger of State Farm Insurance; original photographic art donated by Rosie Faulds; and an anonymously contributed wine gift basket. Tickets are $1 each or 6 for $5. Stop by the library to see the items on display. Join us at the library for this popular annual holiday event. We've packed out the afternoon with a full schedule of entertainments and activities. There will be reader's theatre entertainment presented by Spoken Images at 1:00, singer Kim Lovely at 1:30, Showtunes at 2:00, and pianist Lamar Wyse playing keyboard music at 2:30. Don't miss our annual gingerbread house contest display. The Best in Show grand prize will be determined by popular vote. There will be arts and crafts displays, including hand-made work by the Creative Crafters. Kids, don't miss the make-it take-it crafts and the special storytimes. Also, Bad Kitty Peter Rabbit will be appearing. There will be carriage and wagon rides, including an additional wagon this year and a new route from here to Brownella and back -- convenient since the Historical Society will also be holding an open house there at the same time. The carriage and wagon rides will be provided by Pine Acres Carriage Service, co-sponsored by Galion Building and Loan. Three different local bakeries will be bringing us hundreds of cookies, and punch will be provided by the Friends of the Library. Each person who comes to the library between 2 and 4pm will receive a free raffle ticket which can be entered into a drawing to win either a Kindle Paperwhite with Wi-Fi capability (upstairs) or a Leap Pad 2 Explorer kids' learning tablet (downstairs). 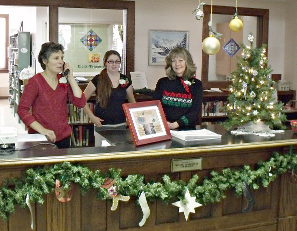 The first Come Home to Galion scavenger hunt ornament, featuring a photo of the library, will also be available. Pick one up at the library before you go out to gather the others, and don't forget to look for us in the parade later. Entry forms are now available at the main desk. Submit the form when you bring in your house during the week of December 2nd-7th. Entries will be on display for public viewing during our Christmas Open House. Judges will award first and second place prizes for each category, and a grand prize for Best in Show will be determined by popular vote, so be sure to vote for your favorite entry (limit one vote per person per day). Griff the Therapy Dog listens to boys and girls read books. An American Labrador Retriever, Griff has been trained as part of Therapy Dog International's Tail Waggin' Tutors program. He'll be here on Tuesdays from 4-5pm. Studies show that therapy dogs calm students so that they can practice, gain confidence, and improve their skills in a relaxing environment. Parents can sign their children up for a ten-minute session of reading with Griff. Call the library or stop by the Children's Room to sign up. We will be screening a newly-released movie adaptation of a bestselling young-adult novel by Cassandra Clare. Popcorn and soda will be served. Registration is required, and space is limited. Call the library or stop by the main desk to reserve your seat. Thu, Dec 5th, 6-8:15pm. These houses won't be edible, but they will be fun to make. Hot chocolate and cookies will be served. For ages 12-18. Registration is required. Call the library or stop by the main desk to sign up. Sat, Dec 21st, 2-4pm. Looking for something new to read? Join us the last Friday of the month. We'll discuss bestsellers, books we're currently reading, and books that are new at the library. We also serve coffee and baked treats. 10am the last Friday of each month. This time, our Bingo for Books program will be run the holiday way , with an impressive array of books, and some other fun prizes, up for grabs. If you are age 18 or older, come play for your chance to win free copies of popular novels (by Danielle Steele, Jodi Picoult, Dan Brown, and other favorites), Christmas books (by Richard Paul Evans, Glenn Beck, Debbie Macomber, Fern Michaels, and more), and several non-fiction titles, too. Refreshments will be served. This event is free, but please register in advance so we can be prepared. Call the library or stop by the main desk to sign-up. Wed, Dec 18th, 6-7:30pm. Dress as a hobbit, dwarf, or other Middle-Earth character, and join us for a Hobbit Feast, riddles, trivia, and celebration of all things Tolkien. The feast will feature a potato bar and desserts. For ages 12-18. Space is limited, so reserve your spot today: call or stop by the main desk to sign up. Sat, Jan 4th, Noon-3pm. With the help of our chess master Mark Papenhausen and other club members, players can learn new strategies, face new opponents, and compete for the top rungs in our ongoing ladder tournament . New members in grades 4-12 are invited to join at any time. Refreshments are provided. You don't need to register for this: it's OK to just show up. We've started a Twitter account for our teen programs. We're still using the Facebook group as well, but here's another way you can keep track of us. Join us Mondays at 6:30pm, Tuesdays at 10:30am, and Wednesdays at 10:30am for stories, songs, crafts, and lots of fun. Spring storytimes in 2014 are planned from January 13th through April 16th, plus April 28th, 29th, and 30th. The Galion Public Library Association will hold our annual meeting for all members. Mon, Apr 14th at 7pm. Come in and watch a 1965 film (starring Annette Funicello and Frankie Avalon) on our big screen in the community room. Directed by William Asher, the movie is the fifth in the Beach Party film series. It featured cameos by Paul Lynde, Don Rickles, and Buster Keaton. Enjoy some light refreshments and pretend for a couple of hours that warm weather isn't months away. All ages are welcome, but children under 12 must be with an adult. This event is free, but please register by calling the library or stopping by the main desk to reserve your seat. Sat, Jan 11th, 2-4pm. Do you have questions and/or concerns about the new Healthcare Marketplace? Are you confused about your QHP options? Navigators have knowledge of all QHP options, as well as Medicaid, CHIP, and behavioral health plans (if applicable). Additionally, Navigators conduct outreach and education; provide fair, impartial information on all QHP options; provide culturally and linguistically competent information in a manner that is accessible for all; and refer grievances and appeals to appropriate state and federal authorities. Join offical CareNet Navigator Michael Culp as he presents information about Obamacare and answers your questions. Wed, Jan 15th, 4-6pm and Sat, Jan 25th, 10-Noon. Do you know how many kinds of corn there are, who invented the supermarket, or how pumpkins saved the pioneers? Do you wonder what Ohio's settlers went through to feed a growing family before the days of Zip-Lock bags, paper towels, and white flour, with limited seasonings and food preservation methods? Join Galion history buff Mike Hocker as he answers these questions and many more during his slide show presentation, The History of Pioneer Cooking . A Q&A session will follow the lecture. This program is an opportunity to put into context all that America has brought to the table, literally. Even non-cooks will find something interesting, since it is about eating, our culture, and our local history as much as it is about cooking. Thu, Jan 23rd, 6-7:30pm. The library is closed all day. Learn new strategies and face new opponents. Join us for a casual game or enter our ongoing ladder tournament and see how many opponents you can knock down a rung. For grades 6-12. New members are welcome any time. Refreshments are provided. You do not need to register for this event: you can just show up. The library will host a Blood Drive in the community room. Please call 1-800-RED-CROSS to make an appointment. (Walk-ins may be accepted as the schedule allows.) Mon, Feb 3rd, 11-4pm. Join us Mondays at 6:30pm, Tuesdays at 10:30am, and Wednesdays at 10:30am for stories, songs, crafts, and lots of fun. Ohio 2013 tax forms and booklets are here, and the federal forms and booklets are now here also. Stop by the library to pick up whichever tax forms you need. The library will be running a Food for Fines promotion during the month of February. The food we collect will be donated to a local food bank. As before, each item brought in is good for one dollar off of fines and fees. Please make sure that the goods are non-perishable and are not past their expiration dates. We cannot accept expired items. This year, the credit can be applied to replacement charges and processing fees, as well as overdue fines. Martha E. Keller will be here to sign copies of her self-published book, Brownie: Mascot of the Seventy-Fifth Naval Construction Battalion Sat, Feb 8th, 2-4pm. Bring your favorite homemade sweets to share and cookbooks to show or trade. Registration is required. Call the library or stop by the main desk to sign up. Sun, Feb 9th at 6:30pm. How much do you know about Bad Bishop William Montgomery Brown, of Brownella Cottage, arguably one of Galion's all-time most interesting residents? Did you know that he authored several books, including one for children? That he employed local students to read to him in his later years? That he died on Halloween? That he was the first Anglican bishop to be tried as a heretic since the Protestant reformation and the first of any denomination in America to be dismissed for his heretical teachings? Kristen Hoffert will discuss these details and more about his fascinating life and home. This program is free, but registration is required. Call the library or stop by the main desk to sign up. Bring your favorite tragic poem or story of doomed romance to share. We'll celebrate the unromantic side of the most romantic day of the year. Crafts, food, and games await you, but registration is required. Call or stop by the main desk to sign up. For ages 12-18. Fri, Feb 14th, 4-5:30pm. We've scheduled a couple of computer classes in March. Registration is required. There is a $2 charge per person for the class, due when you sign up. Stop by the library to reserve your seat. Play for your chance to win free copies of books by popular authors, including best-selling novels as well as non-fiction titles. Light refreshments will be served. For ages 18 and older. This event is free, but registration is required since space is limited. Call the library or stop by the main desk to sign up. Tue, Mar 11th, 6:30-8pm. Do you have questions and/or concerns about the new Healthcare Marketplace ? Are you confused about your QHP options ? Join official CareNet Navigator Michael Culp as he returns to present information about Obamacare and answers your questions. Thu, Feb 27th, 5-7pm, Sat, Mar 1st, 10-Noon, and Wed, Mar 5th, 6-8pm. Join other home-schooling families with students of all ages for some unstructured social interaction time in our Community Room each week. (Parents can make friends with each other too.) This program is free, and there is no need to register: you can just drop by. April 13-19 is National Library Week, a week-long celebration of the library and our patrons. All participants will play four games, and prizes will be awarded to the top finishers. This tournament is open to ages 9-19. Registration is required. Eat before you come, and plan to be here no later than 11:50am. A light lunch will be served between the second and third games. Sat, Mar 8th, Noon-5pm. Join us in the Community Room and watch a recent movie on our big screen. For ages 12 and up. Registration is required. Thu, Mar 6th, 6-8:15pm. Join us in the Community Room and watch a popular movie, based on Suzanne Collins' bestselling trilogy, on our big screen. This event is for ages 12-18. Registration is required. Plan to arrive between 5:45 and 6pm. The movie will begin promptly at 6. Fri, Mar 14th, 6-8:30pm. Join us in the Community Room and watch a fun winter movie on our big screen. You can even bring pillows and blankets to get comfortable. Registration is required: call or stop by the children's room to sign up. Sat, Apr 5th, 2-3:30pm. Come to the library and hunt for the leprechaun's gold. For grades 3-6. We'll also do crafts and make our own green milkshakes. This program is free, but registration is required: call or stop by the children's room to sign up. Sat, Mar 15th, 2-4pm. Join us for a fun scavenger hunt based on the book by Chris Grabenstein. For grades 3-6. Registration is required. Call or stop by the children's room to sign up. Sat, May 17th, 2-4pm. Help us celebrate the author's 110th birthday with a fun afternoon of crafts, games, and stories. Enjoy birthday cake, and make your own Yertle the Turtle to take home. For grades K-2, but please bring an adult with you. This program is free of charge, but registration is required: call or stop by the children's room to sign up. Sat, Mar 1st, 2-3:30pm. Registration is required. For grades K-2, but please bring an adult with you. Sat, May 3rd, 2-3:30pm. Are you interested in learning how to draw but don't know how to start? Fledgling sketchers are invited to join instructor Carol Kable, a local artist, as she reveals techniques and shares pointers on how to get going with basic drawing. This workshop is free, but registration is required, and space is limited, so call the library or stop by the main desk as soon as possible to sign up. Sat, Mar 22nd, 1:30-3:30pm. Presented by Marcheta Gibson. Attending both sessions is recommended. Space in this workshop is limited, so call the library or stop by the main desk as soon as possible to sign up. The library will be taking applications for several part-time student shelver positions. Join Laura Johnson for this free cupcake decorating class. Each participant will decorate two spring-themed cupcakes to take home. Class size is limited, so call the library or stop by the main desk today to reserve your seat. For ages 12-18. Fri, Apr 4th, 4:30-5:30pm. Do you have questions or concerns about the new Healthcare Marketplace (a.k.a. Obamacare )? CareNet Navigator Michael Culp will offer one-on-one sessions in the Staff Room on Mondays from 10—Noon. He will work with anyone who wants to apply for the Healthcare Marketplace. Design a bookmark to help us celebrate National Library Week. Templates and rules will be available at the main desk. Submissions may be dropped off at the main desk during library hours throughout National Library Week, Monday, April 14th - Friday, April 19th. Judging will take place and the winner will be announced on Friday. The winner will receive a $25 gift card, and their entry will be copied and distributed to patrons. Small prizes will be given to the 2nd and 3rd place winners. A jar of candy will be located at the front desk all day. Patrons are invited to guess the number of candies in the jar. The first correct answer we pull will win the jar of delicious sweets, in celebration of National Library Week. Tue, Apr 15th. Help us celebrate National Library Week by going on a blind date... with a book. Staff members will select some of their favorite books and wrap them in plain paper (bearing only the staff member's name who picked the book) with the bar code revealed for the check-out scan, so it will be a surprise when you get the book home. Wed, Apr 16th. Help us celebrate National Library Week by playing our game of Guess the Book. Quotes taken from books will be displayed. Guess which book the quotes are from on a provided sheet. Whoever gets the most correct answers wins a $10 gift card. Thu, Apr 17th. We'll provide the paper. You provide the words. Write your thoughts about the library and its staff, how they've helped you, how the library has impacted your life, etc. Some of these will be shared on book-end displays. Fri, Apr 18th. We'll bring National Library Week to a close by giving back to you, our patrons. Cake and lemonade will be served across from the main desk to anyone who drops by. At this time, the winning bookmarks will also be ready for the taking, and signs congratulating the week's winners will be on display around the refreshment area. Sat, Apr 19th, 1-4pm. Come meet April Boyer and discuss her self-published book, In His Shadow , about her faith and experiences surviving breast cancer. Do you want to meet a local author? Has cancer affected your life? Are you interested in the treatment and recovery process of cancer? If you answered yes to these questions, you won't want to miss April Boyer's book signing. Originally a blog written as an open diary on the highs and lows of her breast cancer journey, the book follows the diagnosis, treatment, and stages of April's cancer. Boyer describes her writing as raw and full of the truths of cancer. She gives the reader healing words of comfort and hope while expressing how God helped her get through the toughest part of her life. Copies of the book will be available for purchase. No registration is required for this event; simply stop by at any time during Boyer's visit. April Boyer is from Ashland, Ohio. Submissions for the poetry contest will be accepted during National Library Week, April 14th-19th. In honor of National Poetry Month in April, we encourage poets aged 18 years and older to submit an original poem for a chance to win this popular contest. Poems will be judged on thoughtfulness, grammar, tone, creativity, style and appearance. No additional artwork, please. Prizes will be awarded for 1st, 2nd, and 3rd place poems. Winning poems will also be displayed at the library and on our web site. Contact Cassie if you have any questions about the Poetry Contest. As you have probably read by now, a major security vulnerability was discovered earlier this week. Most of the websites in the world were vulnerable, and the bad guys have everyone's password. In a nutshell, the Heartbleed vulnerability has allowed attackers to access the private memory of most of the web servers on the internet and retrieve whatever information was there, including the usernames and passwords and other account details of anyone who used the vulnerable websites for the last two years. We are pleased to report that the Galion Public Library website was not and is not vulnerable. Our main website does not have any kind of login or contain any private information, and our Library Catalog does not use OpenSSL, and our CGI server uses OpenSSL 0.9.8, which never had the bug, and does not use it for web traffic in any case. The main take-home point here is that you need to change your passwords for pretty much any websites that you have used within the last two years. For more information about the Heartbleed bug, see Wikipedia, heartbleed.com, or Explain xkcd. The photos from the Fancy Nancy party and from the Teen Unvalentine's event are in the photo gallery now. Let's be honest: we could all use some comedy relief after tax season. We've got you covered. Come in and watch a comedy movie on our big screen. Directed by Ken Scott, the movie we will be showing is a remake of the 2011 film Starbuck. It features cameos by Jay Leno and Bill Maher. Enjoy some light refreshments and relax. This program is for adults. Call or stop by the main desk to sign up for this free event. The Friends will be holding their bi-annual public used book sale. An art show on the library lawn is being planned by the Brush and Palette Club. Over 200 invitations have been sent out to various artists throughout the surrounding area. Watch this space for more information as summer approaches. Sat, Jun 28th.